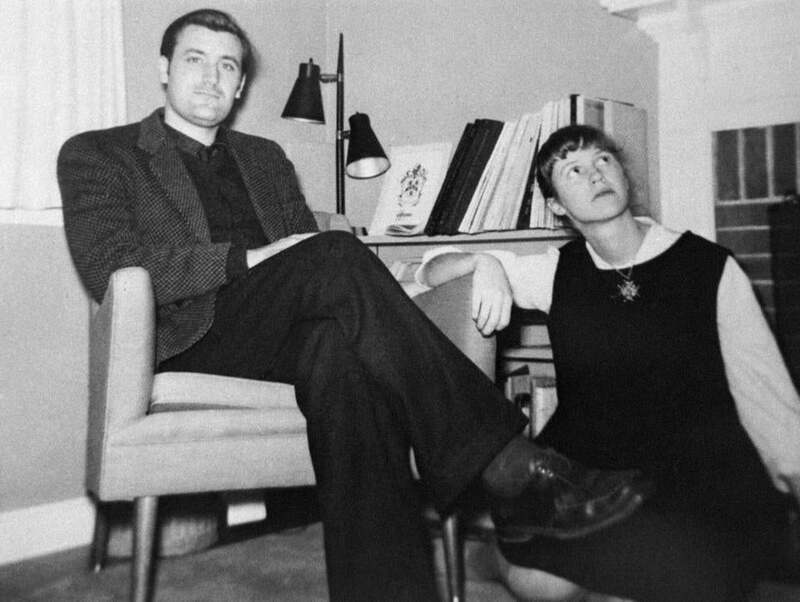 British poet Ted Hughes and his wife, writer Sylvia Plath, together in Concord, Mass., in 1959. Biographer Jonathan Bate begins “Ted Hughes: The Unauthorised Life’’ with a deposition that came to trial in Boston, 1987, over plaintiff Jane Anderson’s alleged portrayal in Sylvia Plath’s novel, “The Bell Jar,’’ and the 1979 film adaptation. Hughes, executor of his late wife’s work, was a defendant. The fascination with their relationship inevitably dominates, despite all attempts to broaden Hughes’s story: his Yorkshire childhood and coming of age in post-war Britain, publications and forays into experimental theater, his numerous adulterous affairs, his love of fishing. Bate juxtaposes the personal against the writing life, which generated children’s books, poetry, translations, and critical prose — ending with tenure as Britain’s poet laureate until his death in 1998. Bate’s reputation as John Clare’s and Shakespeare’s biographer may have initially attracted the Hughes family and estate (now controlled by Hughes’s widow, Carol), known for its defensive stance and insistence on privacy. But unlike most other Plath/Hughes biographers, Bate doesn’t clearly fall into a pro-Plath or pro-Hughes camp. Something, perhaps concerns over the possible airing of previously undocumented affairs, caused the estate to pull its support mid-project in 2014; after that, Bate found himself publishing an “unauthorized” version of Hughes’s life, a decision publicized in open letters to The Guardian. The interpretation pivots on shock and grief. For Hughes and those involved with him, personal narratives begin; they end suddenly; they are reinvented. Here and elsewhere, Bate negotiates the space between person and persona. Hughes’s posthumous presence looms over his son’s 2009 suicide; Nicholas, a fisheries biologist, remembered for “his encyclopaedic command of piscean natural history, his brilliance and creativity and patience and kindness,” lost the “family linchpin” when his father died, “the most important” relationship of his life. The resulting biography leaves one wondering, in a sea of books on Hughes and Plath, how an “authorized” version might have differed, given what this one can and can’t yield about the life of a poet who continues to capture the imagination. Valerie Duff is poetry editor at Salamander Magazine and author of “To the New World.” She is the 2015 poetry fellow at The Writers’ Room of Boston and works at Newbury College. She can be reached at valeriesduff@gmail.com.